Melt butter in a large pan over medium-low heat. Add onions and sauté until soft, 5-7 minutes. Add carrots, squash and dill seed and sauté 8-10 minutes more. Pour in stock, add salt and bring to the boil. Lower heat and simmer, stirring occasionally, for 20 minutes. Purée - either in batches in a blender or use an immersion blender - until smooth. Divide between bowls. 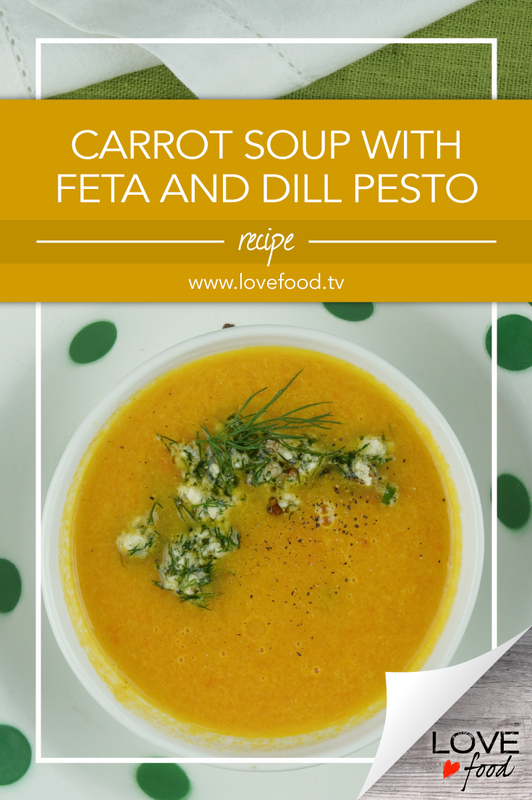 Serve with a spoonful of pesto stirred through each bowl of soup. Combine the feta, pine nuts and olive oil in a bowl. A fork works best. Add salt and pepper to taste. This is a ‘hand’ stirred pesto. It’s supposed to be textured and chunky.